Action Alert: Time to Put It In Writing! 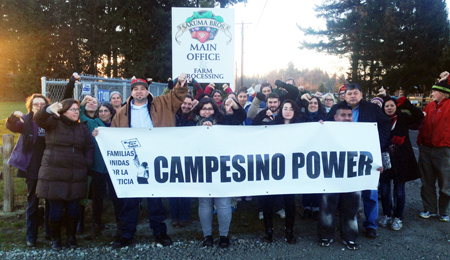 Familas Unidas por la Justicia, an independent farmworker union in Washington, has been fighting for better pay and conditions at Sakuma Brother Farms, a large farm in Washington State, for years. Sakuma Brothers owners and managers have refused to sit down with farmworkers to negotiate a fair contract, instead pointing to improvements made on the farm. If all is as good as Sakuma Brothers claims, putting it in writing should be an easy next step. Now is time for workers to have a voice in their pay and working conditions through a fairly negotiated contract. Read more on our blog, including the refusal of CEO Danny Weeden to accept postcards in support of farmworkers from the National Farmworker Ministry. Sign the petition asking CEO Danny Weeden to sit down and negotiate a fair and binding contract with Familias Unidas por la Justicia. TPP has been signed, now what? You may have heard that the Trans-Pacific Partnership (TPP)was signed in New Zealand last month. But signing does not mean the fight is over! The next step is for the agreement to be ratified. In the US that means both houses of Congress must affirm the agreement. There is much opposition to the agreement from both citizens and within Congress. We need to keep the pressure on! Once trade policies are international law it is virtually impossible to change them. The time to act is now! Write your Representative and Senators today and urge them to oppose the TPP! To make even more impact, follow up with a phone call to your Senators and Representative to reiterate that we need fair trade deals, not another harmful “free trade” agreement created by and for the wealthy. Recently we asked Lee Wallace of Peace Coffee in Minneapolis to tell us about a project she’s excited about. Listen to her talk about the initiative to bring together a business, non-government organization focused on agriculture and trade policy, and scientists to support small-scale farmers practicing agro-ecology. Oregon moves to aggressively raise minimum wage using tiered approach; falls short of $15/hour for all workers. TPP signing represents corporate wish list; farmers, consumers and the environment lose. Business potential of smallholder farmers must be unleashed for sustainable development, report says. Nestle admits slavery in Thailand while fighting child labour lawsuit in Ivory Coast. Economists from Tufts predict TPP will cause income loss, job loss, and contribute to race to the bottom. Trans-Pacific Partnership: Written by and for the rich to further enrich themselves at our expense.